Create an engaging and inspiring approach to learning. Encourage interactive, multi-disciplinary, project-based learning modes; foster curiosity. Provide a variety of learning spaces. Optimize connection to the natural environment. Host community events and promote partnerships with the community. These are some of the priorities articulated by our educators during a day-long session facilitated by our design team from SMMA and EwingCole. 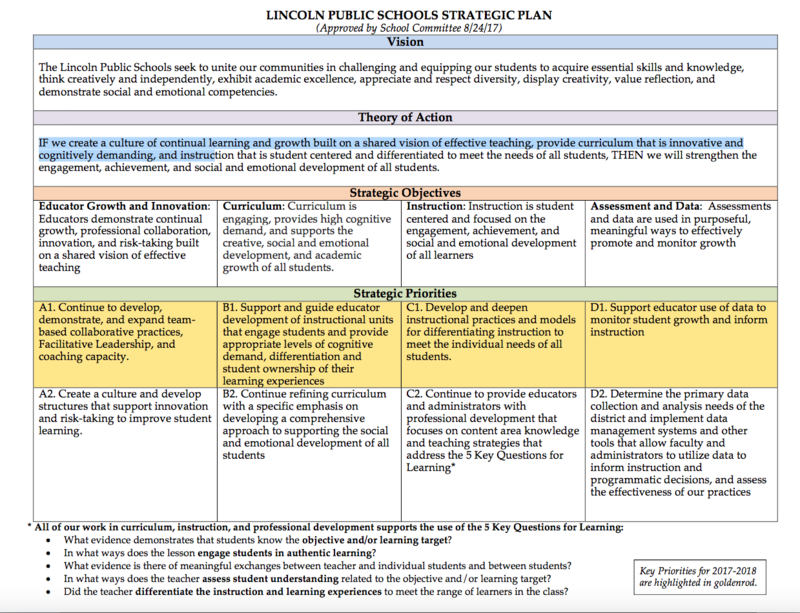 The Lincoln Schools have clearly defined priorities, our faculty and administrators are engaged in dynamic conversations about education, and the question the School Building Committee is trying to answer is: How will the building support our vision of education? Tuesday, October 17th: Please join us for one (or both!) of the Community Workshops focused on how physical space impacts teachers and students. What: How does our current building impede our educators? If a new building is built, or significant renovations made, how will it affect what is taught and how it is taught? How do we know our new/renovated building will meet the needs of the next generations of Lincoln students? Student Input Sessions: Also on Tuesday, members of the design team will meet with groups from the 3rd, 5th, and 8th grades to talk about what they like about the Lincoln School building, see examples of other schools, and discuss what they’d like to see in a new/renovated school. Setting the Context: Phrases such as “21st century learning,” “project-based learning,” and “maker spaces” are used a lot. What do they mean? Here are a series of short videos and links that make them real. Enjoy — and please bring your questions and ideas to one of the workshops on the 17th! We Want to Hear from YOU! We invite you to give us feedback about our blog posts, or ask us questions about the process. You can make a public comment by clicking on the “comment” button at the bottom of the post, or you can send a message directly to the SBC by clicking on “Contact the SBC” on the home page menu. Thank you!